2002-2006 R53 MINI Cooper S Mats. This section is for floor mats, boot mats, and mat accessories. 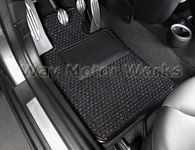 WMW carries Cocomats, OEM MINI Carpet and Rubber Mats, and Rennline.